Oh, sod it, I've got a new mousemat & keyboard ridge thing, both with a gel support for sore wrists, and if I don't write this up now, I never will. So, let's hear it for Errollyn Wallen (above centre), whose new piece 'Mighty River' nearly brought down William Wilberforce's church on Clapham Common on Saturday night. The work was commissioned for this very special concert (mentioned on JDCMB last week) commemorating the 200th anniversary of the act of parliament that resulted in the abolition of the slave trade. It opens with a horn solo based on 'Amazing Grace'; as the music progresses, it really is as if you're travelling down a wide, glowing river with a pulse of life entirely its own, observing flashes of detail and beauty and drama that pass by on the rich tapestry all around. 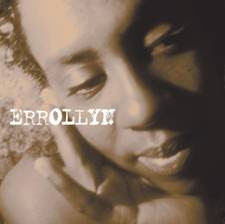 The orchestration is luminous, the mood at once expansive and intimate, the influences perhaps more John Adamsy than we'd have expected so far from Errollyn; and the impact was huge. The Philharmonia seems thrilled with it and in a speech later on, their inimitable chief exec David Whelton promised that it'll have plenty more airings, which it should. Last but not least, conductor Martyn Brabbins led the whole audience in a new arrangement of 'Amazing Grace' by supertalented Philharmonia fiddler Julian Milone - and as it went down a treat at the end of the first half, we did it again at the end of the second. I was horrified when I saw it on the programme ('what, they want us to sing, are you kidding?!?!?') but soon found myself swept up in the atmosphere of fervour, celebration and sheer humanity. A marvellous, unforgettable evening. Holy Trinity is a wonderful venue, without a doubt, and the collaboration of church and art is something that even a confirmed atheist/agnostic like me can applaud and encourage. But this programme should take place next somewhere three times the size - ideally the Royal Festival Hall - and as part of the mainstream season. 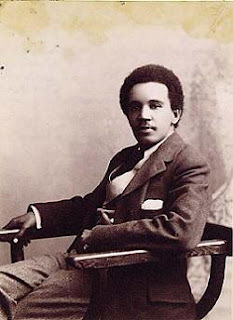 Coleridge-Taylor (above left), having been half African and an idealistic black activist in his day, was a perfect choice for the evening, but the concerto is so wonderful that it should be part of the mainstream repertoire. Go hear it. It's appalling to reflect that slavery still affects millions of people all over the world. Join the fight for freedom 1807-2007 here. UPDATE, 1 MARCH, 10.20pm: Bob Morris writes to alert us to this article in the New Yorker about 'Amazing Grace', a new film about William Wilberforce starring Ioan Gruffud. A thought-provoking piece, recommended reading. Thanks, Bob! Addenbrooke's Hospital takes patient confidentiality very seriously and would never give permission for patient details to be divulged without consent of the individual or next of kin. UPDATE, Wednesday 28 Feb, 5pm: I've decided [entirely on my own choice] to remove certain elements from Hatto discussions from view wholesale. Nobody is trying to censor my blog, though conspiracy theorists will obviously think so. It is quite simply that I'm sick of the whole thing, and am very happy to leave that screenplay to someone else. ...so it seems like a good time to show you the following: a good example of the utterly staggering piano genius that is Grigory Sokolov! I'm off now for the rest of the weekend - work, concert and visiting family all day tomorrow - so here is some magic from the only video of this artist I could find on Youtube. It was apparently recorded in Milan in 1998 and this young man has come a long way since. I believe that he's about to go much further, too... Dear friend Opera Chic, I'll do a deal with you: you can have Rolando, we'll share Juan Diego, but Jonas must be mine! Please welcome: Jonas Kaufmann in Cosi fan tutte. I realised Hattogate was getting out of hand when I found I had a blister on my wrist from contact with mouse-mat edge. The conspiracy theories and Chinese whispers seem to be getting crazier and crazier and I have received a comment or two here that I've not posted because they're way off the deep end - more like something out of sci fi, somewhere between George Orwell and Dr Who, than this rather heart-rending, sorry tale. What put it all in perspective was this: last night some musician friends came round and played us a violin concerto in the front room. Moments like this, you feel so fortunate that you wonder what you've done to deserve it. I mean, honestly: a friend you'd normally have a good laugh with over a cuppa picks up a piece of wood with four strings and a bow, and suddenly it's as if the Alps have taken over your lounge. It was absolutely incredible: breathtaking, uplifting, the works. My problem with the Hatto business is that it's all about recording. Not live performance. Music is about communication, isn't it? It's a direct path from soul to soul - composer-musician-audience - and essentially this can only take place during real-time, one-off performance. I have a fine library of CDs that I enjoy hearing, but none that can move or stir me to that extent - with the possible exception of musicians like Cortot, Thibaud and Enescu who recorded live, wrong notes and all, a very long time ago. Of course recordings crucially fill the gap for anyone who doesn't have access to a concert hall or a piano, but given a choice, I would pick live performance every time. Live music, especially at such close quarters, is one of the seven wonders of the world. I'm now trying to think what the other six could be. A very long and fascinating article on Musicweb International by pianist and critic Christopher Howell, in case you haven't already seen it. You'll need at least 2 cups of coffee for this one. UPDATE: Andrys has made an extremely useful page containing all the links anybody could want on this topic. Essential reading and some audio interviews too. I have to get back to writing about other things today: a top singer, an innovative chamber ensemble and teaching organisation and five CDs for review require urgent attention, plus I've got a friend coming round to play through a violin concerto tonight (with piano, not orchestra) (with a real pianist). On an Overgrown Path has distressing news that there is to be no more live music on BBC Radio 3 after 7pm except the Proms and the occasional one-off. They're losing a lot more than that: namely, the plot. And so, consequently, are we. ...The Telegraph has an article in which William Barrington-Coupe says that his wife Joyce Hatto's recordings were genuine. He 'can't explain some of the things they say are there'. He also points out wryly that if he'd wanted to make a lot more money, he'd have used a Russian name for the pianist. But in the Broadcasting House foyer (where, my dears, you see everyone who is anyone), I bumped into Mitsuko Uchida, who was on her way to Radio 3 to appear on In Tune. Now there's one truly great artist - a pianist you couldn't fake if you tried. Her playing could never have been anybody else's. I've often felt that for her, the piano is like a second voice box. It's part of her, indivisible from her personality, indeed her soul, and that's how it ought to be. UPDATE: To hear Mitsuko's interview on In Tune, go here, browse the Radio Player for In Tune and click on MON. You can listen to it online for the rest of this week. David Hurwitz has a splendid editorial about the Hatto-trick [sorry, couldn't resist that!] at Classics Today. Alex Ross makes some astute comments: the recordings are not forgery, but plagiarism. Soho the Dog, whose blog I' m afraid I hadn't seen before, is sniffing out some interesting angles too. Pliable of On An Overgrown Path has been trying to get some answers from Hatto's husband and the owner of the Concert Artist record label, William Barrington-Coupe. A commentator on one of the newsgroups demanded to know when someone would volunteer to write the screenplay. HELLO, OVER HERE!!! Meanwhile, I've been to hear a very real concert by Marc-Andre Hamelin (and found that I do have to wait to hear him play Op.111 after all, because the programme involved only Op..109 and 110. [only?!? ])...The Beethoven was beautifully thought out, the pacing and emotional shape of Op.110 especially so. But it's his exquisite-toned, other-worldly Schubert B flat Sonata that will stay with me forever. "I think that we'll really just have to wait and see - and wait and see we will surely be able to do, for this, as I have suggested, is unlikely to go away again now and, given the sheer number of other parties with potential involvement (other artists, other record companies, etc. ), it is likely also to run and run when it finally does get to court. Robert von Bahr of BIS in Sweden has so far commented, albeit rather wryly and in a carefully owrded manner that could be taken to imply that he'll not likely be reticent with the ammunition if and when he may believe it becomes necessary to use it. The sheer scale of this fraud - IF it is such (and I do stress the "if") is such as to ensure that the case may well drag on into next year even on its own merits alone, but if it becomes the tip of the iceberg in the industry as a whole (which is not entirely inconceivable), then we could be looking at decades of litigation rather than merely months or years in a massive multiplicity of cases." There's also a Google group with some good threads. Thanks to Stephen Pollard, Opera Chic and Lisa for shoutouts. Breaking news on Gramophone's website reveals one of the most extraordinary stories to have come our way, ever. Recorded between 1990 and 2004, these performances are reissued in brilliantly refurbished and clarified sound, forming part of a 100-CD discography. Indeed, it is no exaggeration to say that no other pianist, male or female, would even have considered such a comprehensive undertaking. Doubting Thomases, of which there are apparently many, may well wonder how Joyce Hatto achieved such unalloyed mastery and musicianship when tragically beset with ill-health. But others will surely celebrate an awe-inspiring triumph of mind over matter, of the indomitable nature of the human spirit. Even in the most daunting repertoire, her poise in the face of one pianistic storm after another is a source of astonishment. Her warmth, affection, ease and humanity strike you at every turn, her scale and command without a hint of superficial or hard-nosed virtuosity. Here, Liszt's occasional histrionics and theatricality are tempered with the most aristocratic quality. In Preludio, the dazzling curtain-raiser, Hatto yields nothing to any other pianist in fearless authority, while the notorious difficulties of Feux follets are resolved with a surpassing fluency and vivacity. She is no less gloriously responsive to La ricordanza's heady romanticism (for Busoni, 'like a packet of yellowed love letters') and Etudes Nos 10-12 are natural triumphs of an unswerving vision and poetry, concluding performances that form a rare tribute to their symphonic weight and breadth, the quasi-orchestral might of Liszt's outsize opus. The same attributes apply to Hatto's Chopin-Godowsky. And whether you consider Godowsky's elaborations delectable or outrageous - or both - you will only hear pure music from this pianist. Listen to her in Ignis fatuus (No 4) where, as Hatto herself ruefully puts it, Godowsky adds a few extra hours to your practice, or in the 'touch of paprika' she notes in the coda of No 7; in No 27 where Godowsky turns innocence into experience and sophistication with a vengeance, or in No 8 in what Hatto calls 'a riot of bravura ingenuity' ' you can only listen and wonder. Amazingly, she has all the time in the world to make her points in the turbulence of No 20 and what gentle sparkle, what unforced brilliance in 'Badinage', where Godowsky so mischievously gives you two Etudes for the price of one. 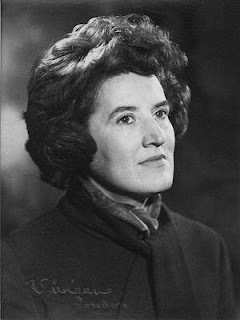 Joyce Hatto may well be 'the greatest pianist no one has heard of'; her work demands a book rather than just a review. I heard rumours some time ago querying the authenticity, or otherwise, of Hatto's recordings, but didn't take much notice: British critics are notorious for ignoring home-grown female pianistic talent, so Hatto's lifetime of neglected genius didn't seem unconvincing. But recently another Gramophone piano critic had a strange experience. He popped the Liszt disc into his computer's CD player and iTunes identified it...as a recording on BIS by the Hungarian pianist Laszlo Simon. Gramophone sent off both recordings to have their wavelengths checked. They turned out to be identical - except for two tracks, which were identical with a CD called Nojima Plays Liszt. The plot thickens. The engineer checking the waves thought the Godowsky, so glowingly reviewed, sounded a little odd. Sure enough, it turned out that the recording had been 'stretched' by 15.112 per cent ("all the time in the world," eh?). When the 'stretch' was undone, the soundwaves proved identical with a recording by Carlo Grante. And her Rachmaninov piano concertos recordings? Yefim Bronfman on Sony. If her glorious Liszt recordings really are Laszlo Simon's, I think he can open some champagne. 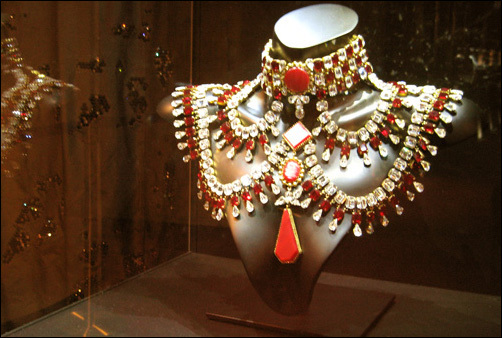 Here is the evidence, from Pristine Classical. Read more on the Gramophone website here. An interview with her from Musicweb International. And a fascinating article about her by Ates Orga. The mind boggles. Updates when I have any. Tom is off to see Arsenal play Blackburn at the Emirates Stadium tomorrow. "I'll pick you up, mate," said his pal, "but whatever you do, don't wear that effing trenchcoat, you'll get slaughtered." And you think there's a dress code at the opera? UPDATE, 2.20pm: Janos asks about the coat. It's an Australian riding coat by Drizabone, which does what it says on the label, keeping you dry as a bone, and, if you get the sheepskin lining, warm as toast too. Tom lives in one of these all winter. Here's a company that will ship 'em anywhere in the world. The hats are also great. Opera Chic on dating 'Big Willy' Furtwangler...! What a shame that the blacklist she mentions seems restricted to the US. Latest on the King's Row soundtrack release: Brendan Carroll tells me that it is a co-production of Turner with Film Score Monthly on the Screen Archives label. He thinks it will now be a May release as more work is required on the restoration. Booklet will include an 8000-word essay by Brendan on Korngold, the score and the film. Marc-Andre Hamelin will be at the Queen Elizabeth Hall on Sunday afternoon, 18 February, 3.30pm, to play Beethoven's two last sonatas and Schubert's B flat sonata D960. Marc has possibly the greatest piano technique on earth, but he's the human face of virtuosity. Those twinkling fingers are there to serve a great heart. Not just speed, but tenderness. While he's always been recognised more widely for performances like the second of the two extracts that follow, I can't wait to hear him in Op.111. Box office: 0871 663 2500. Love is in the...cello section?? And I still say three cheers for the good old violin. There's a reason why violinists are called fiddlers... On Friday Tom and I celebrate the 10th anniversary of the day we met, so someone must be doing something right. ...the Grauniad has decided that Madama Butterfly is racist, courtesy of Roger Parker of King's College London. Hasn't anyone there seen it? Presumably not, or they'd know that it's one of the strongest anti-racist arguments in the whole bloody opera world. This is the same newspaper that would like to ban Gershwin's masterpiece Porgy and Bess. Can't wait to see what they'll have to say about Carmen Jones at the RFH this summer. Puzzled as to why the Philharmonia hasn't been shouting about this from the rooftops... here's the link.... Fab reason for concert, a world premiere of a new work by the very cool and humungously talented Errollyn Wallen, a chance to hear Philippe Graffin play the Coleridge-Taylor Violin Concerto in case you missed it at the 05 Proms, the excellent Martyn Brabbins conducts, and it's FREE. You just have to find your way to Clapham Common. Call the box office to reserve tickets. On Saturday 24 February, the Philharmonia Orchestra and one of Lambeth’s most historic churches, Holy Trinity Church, Clapham, have teamed up to mark the 200th Anniversary of the Abolition of the Slave Trade Act in a special commemorative evening. Tickets are FREE but ticketed. To reserve your seats please call 0800 652 6717. There will be a retiring collection and proceeds will go to Holy Trinity Church and Anti-Slavery International. 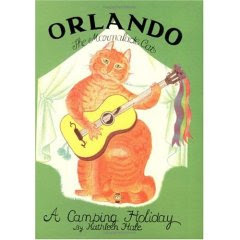 Orlando: what was that about marmalade? Opening at Covent Garden on 26 February, "a tale of conflicting passions, threats, magic, deceit and revelations which inspired Handel to some of his most original operatic work..." Francisco Negrin directs, stars include Bejun Mehta and Rosemary Joshua. Info here. Here's one of our regular Korngold updates for this year, the 50th anniversary of the composer's death. My prolific thanks to Korngold devotee and biographer Brendan G Carroll for keeping up the flow of info! In March, the complete film score of THE SEA HAWK will be released on Marco Polo/Naxos. In April, the complete sound-track of KING'S ROW is due out on CD, conducted by Korngold himself, from archive studio recordings from Turner/Rhino. In case you haven't seen KING'S ROW, it's the one where Ronald Reagan's legs are amputated. He wakes up and calls out to his wife, "Where's the rest of me?!?" Which is what a lot of other people wondered too, some years later... seriously, though, it's a terrific score and the film is not bad either. On 1 May at the Queen Elizabeth Hall, the BBC Concert Orchestra conducted by Barry Wordsworth will play the gorgeous Sinfonietta - a symphony in all but name, written when EWK was only about 15. It's full of sweeping melody, beautiful orchestration, Klimtish-Jugendstil atmosphere and EWK's typical generosity of spirit. Here's a recording by the BBC Philharmonic under Matthias Bamert. In the concert's first half, those two stalwarts Philippe Graffin and Raphael Wallfisch will play Miklos Rozsa's Double Concerto, which is one heck of a fantastic piece too (hear their recording). More Korngold soon - introducing a Korngold 2007 label to make it easier for fans to follow the updates en masse. A note from David K Israel alerts me to Mentalfloss.com, where he's joined the blogging team. David was Leonard Bernstein's editor and is a fellow novelist, but most significantly he nearly named his cat Solti, then chose Lenny instead. In case you missed my intentionally-very-silly two-part story for Classical Music Magazine around Xmas & New Year, it's called LENNY: THE CAT THAT SHOOK AN ORCHESTRA and you can read part 1 here and part 2 here. As for transatlantic Lenny and my resident Sir Georg 'Ginger Stripes' Solti, they send each other colleagial greetings and compare the mice they've recently killed with their built-in batons. 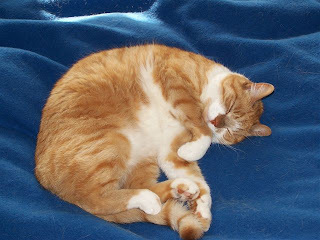 We named Solti Solti because in a former life he was Tom's favourite conductor. Most orchestral musicians jump out of their skins when we tell them this - one cellist who used to live nearby famously threatened to run our cat over every time he came round - but Tom, being from one of those indomitable central-European pre-War families, is used to larger-than-life personalities and knows how to stand up to them. In one legendary LPO rehearsal, Solti turned to the first fiddles and said "You must play this better, I pay you money if you play this better!" Tom put up his hand and demanded "How much?" Solti exclaimed: "Ah, we discuss it later..."
ALICIA'S GIFT is available for preordering at Amazon.co.uk here: beautiful quality, limited edition hardback! Release date is 8 March. The paperback will be out later in the year. If you haven't yet sampled the enchanting songs of Pauline Viardot - or even if you have - just try these gems from Cecilia Bartoli, accompanied by Jean-Yves Thibaudet. Nuff said. I never quite 'got' it before. Il trovatore was way over my head. Too difficult. What's going on? Blood and guts, sure - but why? Am I too stupid to understand? Last night we went to see it at Covent Garden, to catch Marcelo Alvarez [above - photo by Catherine Ashmore] doing that high C. Finally, I got it. The blood and guts are for the sake of it. Oh. Right. Someone once said that all you need to perform Trovatore successfully is the four greatest voices on earth. Covent Garden has at least one who's seriously impressive: Stephanie Blythe as Azucena. Blimey, guv'nor, no wonder Manrico is dominated by his madre! (I read that the Covent Garden premiere in 1855 starred Pauline Viardot: that must have been an experience of a lifetime...) As for Alvarez, he has plenty of brawn and went for it molto con belto, which I guess is which he's meant to do. Orchestra under Nicolo Luisotti was jolly impressive - sensitive, careful, singer-oriented accompanying (which was more than could be said for Pappano in Carmen). And somewhere there lurk the ghosts of the Marx Brothers. They couldn't have chosen a better piece to take off in A Night at the Opera. I still expected Groucho to swing from the rafters, Harpo to materialise under Azucena's headscarf or the orchestra to burst into 'Take me out to the ball game'. They didn't. But it's still a rip-roaring good night, once all disbelief has been set to 'off' for three hours. 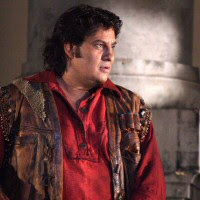 Here's a quick Trovatore quiz. No prizes. c) thinking 'heck, let's get those top notes, then go eat'? c) totally stupid, throwing herself away on a man who loves his mother better than he loves her? 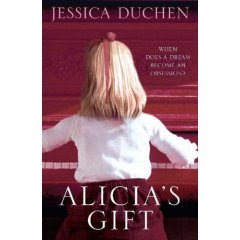 The first copy of ALICIA'S GIFT is due in tomorrow, I've met my deadlines, Tom earned brownie points in a beautiful charity concert last night and I have time, for once, to tidy my study. So here, to celebrate, is a picture of Solti the cat. 'Sir Georg' at his fuzziest. Have a look at his blog too sometime. 1 February is my favourite day of the year, because it's the furthest point away from the next time it's January. I'm one of those people who needs light in order to feel OK about life, and now the days are getting longer, the daffodils are growing in the garden and the hellebores are in bloom under the apple tree. I've taken the plunge and declared the first draft of Novel No.3 ready for my advisory panel to read, although the book is still a structural nightmare and needs to shed at least 20,000 words. The Tomcat is in the middle of chapter 2 and says he loves the characters, which is encouraging; copies are going out to my agent, my editor and a select expert or two. Not long ago 'Janos' asked to know more about it. If you cross 'An Equal Music' with 'A Short History of Tractors in Ukrainian', throw in a dose of Symbolisme, a teaspoon of Trollope (Joanna), Philippe Graffin's CD of bohemian-influenced violin works 'In the shades of forests', Bartok's Cantata Profana and a large dollop of goulash, then you might start to get some idea.... Well, you did ask! Meanwhile, the first finished copies of ALICIA'S GIFT are due in on Monday! Five weeks to go til publication day. You alone remain to me. It's from La Gioconda - Callas's first big success. An article in today's Times asks whether these words, scribbled by the soprano in a hotel room, were indeed a long-after-it-was-over love letter to her first husband, or something even more significant regarding her professional hopes and regrets. Our 30th anniversary Callas exhibition here in London is a modest affair at the Italian Cultural Institute - quite a far cry from the Swarovski bonanza ladelling on the glamour in New York (Opera Chic has the pics - look out for the Traviata piece - blimey, how does anyone stand up, let alone sing, in a thing like that?!). But I guess that's the difference between London and New York. We're still so hung up on being tasteful over this side of the pond that we sometimes miss out on the fun. Not to mention the bagels.